Heating Service & Repair | Lincoln, Beatrice NE | Noakes Inc.
NATE is the leading nonprofit certification program for technicians in the HVAC industry. 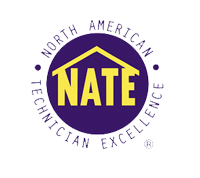 When you hire a NATE-certified technician for the installation, maintenance or service of your heating and cooling system, you'll know that you are hiring a skilled professional. Carrier Factory Authorized Dealers must perform to rigorous national standards consistently and continually in order to qualify for factory endorsement. We also participate in extensive factory training on technical aspects of equipment installation, maintenance and repair. As an Amana Dealer, our technicians are trained to install and service all models of equipment. Amana brand heating and cooling systems offer premium performance, long lasting reliability, and a great match for your specific indoor comfort needs. As Geothermal experts, Noakes, Inc. installs WaterFurnace heat pumps. WaterFurnace geothermal systems are among the most efficient, energy saving, environmentally conscious heat pumps you can purchase. Home Builders Association of Lincoln is a trade organization which promotes home building through professional education, member communication and civic participation. The mission of the Beatrice Area Chamber of Commerce is to enhance the Business Environment and Economic Base of the Beatrice Area. The Lincoln Chamber of Commerce makes it easy for local business to increase exposure, take advantage of networking opportunities, and access information and services that can increase business efficiency.